Encino Cosmetic Dentistry : How are dental implants placed? 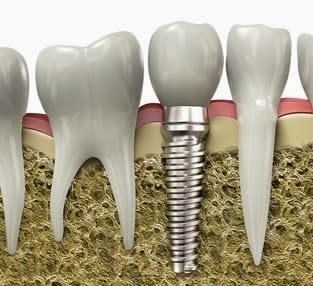 Dental implants are the most advanced and effective long term solution for missing teeth available to date. They extremely natural-looking and require only minimal care, which make them a great option for almost anyone. Teeth that are not replaced can lead to a variety of health issues and can often make you look much older than you really are. If you are looking to have any teeth replaced, please contact our dental office for an appointment to discuss tooth replacement options. The dental implant procedure from start to finish can take several months because enough time is requires to pass before the final dental crown is placed. This is because the portion of the dental implant that mimics the root is placed into your jaw bone. The gums will need to heal following this portion of the procedure which is usually the longest. Complete gum healing can take up to about 4 months. Dental implants can be placed at a dental office or in a hospital setting. Local anesthesia is sometimes used although there are various other types of oral sedation that are adequate as well. Each dental implant procedure is different depending on the patient’s individual case, how much time has passed since the teeth were lost and density of the jaw bone. Our dentist will discuss the steps of your dental implant treatment in particular prior to starting the procedure. If you would like to know more information about dental implants or would like to schedule a consultation, please contact our office today. We look forward to restoring your smile!